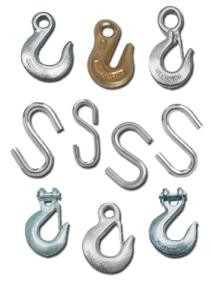 As part of our wide variety of in-stock hardware available for immediate delivery, Armstrong / Alar – Chain Corporation offers a complete line of hooks, including S-Hooks, Eye Hoist Hooks, Clevis Grab and Clevis Slip Hooks and Eye Grab and Eye Slip Hooks for your every need. All of our Rope hooks are available in alloy and carbon steel. Eye hoist hooks, clevis slip hooks, and eye slip hooks are available with or without safety latches. Carbon steel eye hoist hooks are available in sizes with working load limits from 1/2 to 15 tons; alloy eye hoist hooks are offered in sizes with working load limits from 3/4 to 22 tons. Carbon steel and alloy eye hoist hooks are available with or without safety latches. Clevis grab hooks are offered in sizes that will handle 1/4″ to 3/4″ chain. Carbon steel clevis grab hooks have a working load limit (WLL) ranging from 2,600 to 20,200 pounds. Alloy clevis grab hooks are also available in sizes that will handle 1/4″ to 3/4″ chain, with a WLL ranging from 3,500 to 24,700 pounds. Carbon steel clevis slip hooks are available in sizes that will handle 1/4″ to 3/4″ chain, with a WLL ranging from 1,950 to 12,500 pounds. Alloy clevis slip hooks are offered in sizes that will handle 1/4″ to 3/4″ chain, with working load limits ranging from 2,750 to 19,250 pounds. Both carbon steel and alloy clevis slip hooks are available with or without safety latches. Eye grab hooks are offered in sizes that will handle 1/4″ to 3/4″ chain. Carbon steel eye grab hooks have a WLL ranging from 2,600 to 20,200 pounds. Alloy eye grab hooks are also available in sizes that will handle 1/4″ to 3/4″ chain, with a WLL ranging from 3,500 to 24,700 pounds. Carbon steel eye slip hooks are available in sizes that will handle 1/4″ to 3/4″ chain (in 1/16″ increments), with a WLL ranging from 1,950 to 12,500 pounds. Alloy eye slip hooks are offered in sizes that will handle 1/4″ to 3/4″ chain, with working load limits ranging from 2,750 to 19,250 pounds. Both alloy and carbon steel eye slip hooks are available with or without safety latches.